When somebody mentions pie, two things come to mind; pecan pie and my mouth. When somebody says such and such is as American as apple pie, I snicker and mock their prudish pedestrian profession. 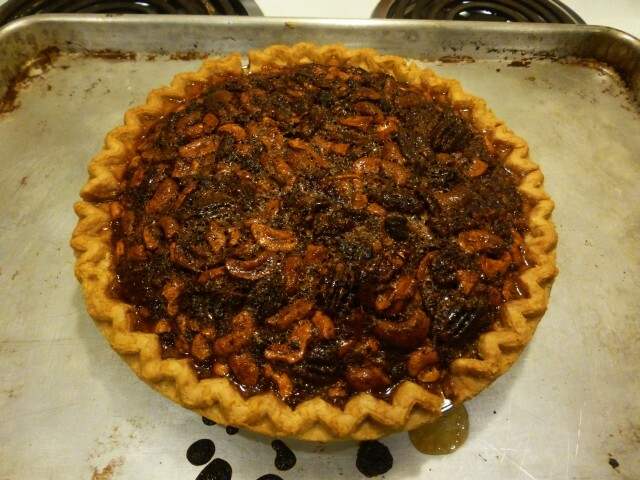 Pie, man, PIE is made for pecans and pecans is made for pie. As you might know, I am never satisfied with “normal” recipes and will not accept rote recipes without lifting my leg and decorating them with my own touch. This recipe is no different in that respect. In fact, I may have gone a bit overboard! You need not add everything that the title suggests. It is a superwhamified version of Karo’s classic pecan pie recipe. Bake on center rack of oven for 60 minutes. Cool for 2 hours on wire rack before serving. Yawn. I mean it’s good but nowhere as good as the super exciting version below. The Tabasco sauce in it does not make it hot and spicy. If anything it gives it a mild fruity flavor. Add more if you want it to be hot. I snip my bacon across the slice into 1/8 inch matchsticks using scissors. I also toast the pecans in a small pan over medium-high heat, flipping or stirring frequently. Don’t go for browning, just go until they’re good and hot, hotter than your tongue would accept. Mix corn syrup, maple syrup, eggs, sugar, butter, vanilla, bourbon, and Tabasco sauce using a spoon. Stir in pecans and cashews. Pour filling into pie crust. You can leave out the maple syrup in favor of all corn syrup (makes a firmer pie). You can leave out any other ingredients that make you feel icky. I prefer the bacon cashew Tabasco version but I just had to develop an over the top version in order to keep my WTF credentials current. This is the type of pie you can eat with your hands without goo running all over them. Perfect for pies-on-the-go. Whichever version you end up making, you will be amazed at just how simple it is to make your very own Pie Of The Gods. If you you are going to go to all the trouble of making your own pecan and adding why not explore the joys of making syrup?